WordPress 4.4 “Clifford” (named for jazz musician Clifford Brown) was released with over 2,000 contributions by 471 contributors. That’s the largest number of contributors to a point release by far. Here’s the short launch video for this version. While used primarily as a blog or CMS, WordPress has evolved through out the years into a complex framework. This means integrations with other apps or simply custom built web-apps on top of WordPress are quite common and developers have been doing this for some time. However, WordPress 4.4 makes the first step in standardizing a common REST API that can be used and extended by 3’rd party themes and plugins, thus providing a common ground, similar to what custom post types and custom fields did when they were introduced back when WordPress 3.0 was released. What’s included right now is the infrastructure for the REST API, so you can’t just yet access a url like “http://demo.wp-api.org/wp-json/wp/v2/posts” and get a JSON file with your posts. You’ll still need the WP-API plugin for that. This means that for plugin and theme authors, you can start building new APIs for your project using the infrastructure now in core. Front facing applications still need the plugin mentioned above for endpoints. So it makes sense for Automattic to rewrite their WordPress.com interface, but where does that leave the rest of the users? For End Users, they can use Calypso for posts and pages for Jetpack enabled sites. And with the new API in place the integration will probably be extended as it’s limited to the standard WordPress settings (no support for custom post types or metaboxes). Also expect various solutions that will extend the default WordPress functionality and perhaps custom interfaces that are more user friendly then the current page refresh type of application we have now. As for developers and power users, nothing will change over night, but with the API in the core it’s now possible to have a leveled ground on which to build new stuff, without 3’rd party dependencies or a changing schema with new versions of the API. This stability can bring new interfaces for themes and plugins. Right now, uploaded images in WordPress get cropped to various sizes: small, medium, large, as well as any custom sizes defined in your current theme. However, when inserting a image in a post you can only choose one of these sizes. That’s not an issue if you view the page on a desktop, however when you access it via a mobile device you’ll end up downloading a 1000px wide image when your screen is 400px wide. Ideally, you would want to serve the cropped version to mobile devices based on their viewport size. This way, the browser will automatically use and display the right image based on the device’s screen size. There are no settings with this feature and happens automatically starting with WordPress 4.4. Older images will automatically get the sizes and srcset attributes, so again nothing to do except enjoy a faster loading time on mobile devices. 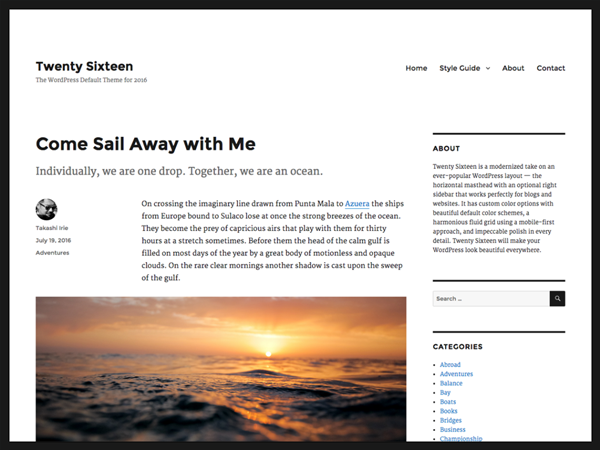 Twenty Sixteen is the new default theme for WordPress designed by Takashi Irie. As with all new default themes, it only comes with new installations, so you have to manually install it if you upgraded to WordPress 4.4. What I like is that it works for blogs and websites due to the the horizontal masthead with an optional right sidebar. It has custom color options with default color schemes and a fluid grid using a mobile-first approach. Instead of linking to other sites, simply embed the articles. This new feature means that any post or public post type will now be embeddable. If you’re using pretty permalinks, the embeddable content will be available at example.com/your-post/embed/. Embeddable posts are on by default and there is no UI to turn it off. The focus for the Customizer in 4.4 has been to improve performance, and there are some drastic improvements in this release. More info is found on the Make WordPress Core blog. This is part of the larger Taxonomy Roadmap. In WordPress 4.3 shared taxonomy terms were eliminated and now we have access to a API to add taxonomy meta so you can make it easier to add images or icons to categories and tags if needed. WP_Title is not deprecated, although add_theme_support( 'title-tag' ); is the recommended way to insert the title tag in themes. WordPress 4.4 and the future 4.5 have the potential to be one of those memorable releases like 2.7 (new design), 3.0 (custom post types) and 3.8 (current admin design). Having a way to interact with WordPress data without using PHP via the REST API without 3’rd party gently pushes everyone who works with WordPress in considering alternative ways in which to build websites and web-apps. While nothing drastic will happen anytime soon, I’m sure in the coming years we’ll see new ways in which we use and develop on WordPress. Big thanks to Scott Taylor who led the release as well as the 471 contributors with props in this release. Previous Previous post: What is WordPress Calypso and what does it mean for self hosted sites?